After Chávez’s death was announced on 5 March 2013, Maduro assumed the powers and responsibilities of the President. A special election was held on 14 April 2013 to elect a new President, and Maduro won with 50.62% of the votes as the candidate of the United Socialist Party of Venezuela. He was formally inaugurated on 19 April. He has ruled Venezuela by decree since 19 November 2013 through powers granted to him by the Venezuela legislature. His presidency has coincided with a decline in Venezuela’s socioeconomic status, with crime, inflation, poverty and hunger increasing; analysts have attributed Venezuela’s decline to both Chávez and Maduro’s economic policies, while Maduro has blamed speculation and an “economic war” waged by his political opponents. Shortages in Venezuela and decreased living standards resulted in protests beginning in 2014 that escalated into daily marches nationwide, resulting in 43 deaths and a decrease in Maduro’s popularity. Maduro’s loss of popularity saw the election of an opposition-led National Assembly in 2015 and a movement toward recalling Maduro in 2016, though Maduro still maintains power through loyal political bodies, such as the Supreme Court, National Electoral Council and the military. After entering a constitutional crisis when the Supreme Tribunal removed power from the National Assembly, months of protests occurred in 2017, leading Maduro to call for a rewrite of the constitution and resulting in at least 153 deaths. The Constituent Assembly of Venezuela was elected into office 30 July 2017, with the majority of its elected members being pro-Maduro. On 20 May 2018, Maduro was reelected into the presidency in what the Atlantic Council and Financial Times described as a show election which had the lowest voter turnout in Venezuela’s modern history. Like Chávez, Maduro has been accused of authoritarian leadership, with mainstream media describing him as a dictator, especially following the suspension of the recall movement that was directed towards him. Following the 2017 Venezuelan Constituent Assembly election, the United States sanctioned Maduro, freezing his U.S. assets and prohibited him from entering the country, stating that he was a “dictator”. The majority of nations in the Americas and the Western world also refused to recognize the Constituent Assembly and the validity of his 2018 reelection, initiating their own sanctions against him and his administration as well, although allies such as China, Cuba, Iran, Russia and Turkey offered support and denounced the interference in Venezuela’s domestic affairs. Despite encouragement to resign as president when his first term expired on 10 January 2019, President Maduro was inaugurated by Maikel Moreno, Chief Justice of the Supreme Tribunal of Venezuela. This resulted in widespread condemnation; minutes after taking oath, the Organization of American States approved a resolution in a special session of its Permanent Council in which Maduro was declared illegitimate as President of Venezuela, urging that new elections be summoned. The National Assembly invoked a state of emergency and some nations removed their embassies from Venezuela. With their belief that his election was illegitimate, they claimed that by retaking power, Maduro was converting Venezuela into an illegitimate de facto dictatorship. Additionally, on 23 January 2019, the President of the National Assembly, Juan Guaidó, was declared the interim President by that body. 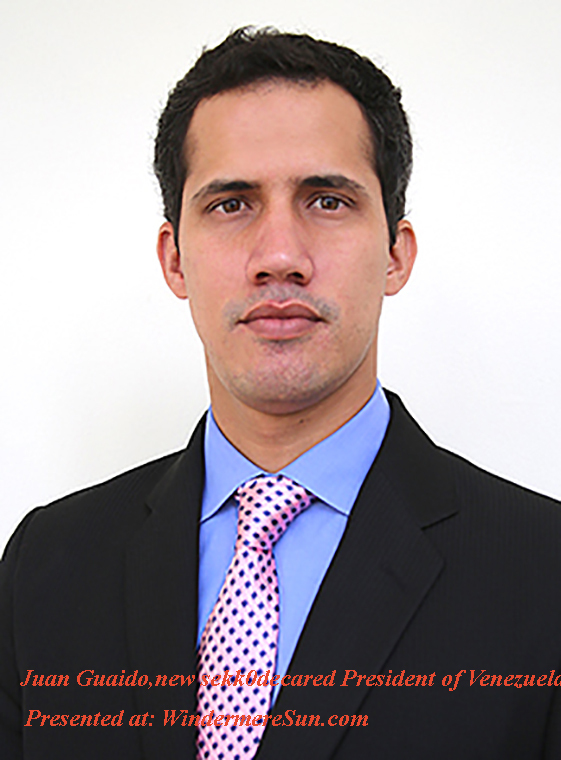 Guaidó was immediately recognized as the legitimate President by several nations, including the United States and the Lima Group, as well as the Organization of American States. Maduro disputed Guaidó’s claim and broke off diplomatic ties with several nations who recognized his claim. Next story Is Michael Cohen’s Postponing Testimony For Safety?